Inflatable Outdoor Advertising - Great ROI! Inflatables are a powerful visible promotion at much lower cost than newspaper, radio or television - delivering more promotional value than any traditional form of advertising. Make your business stand out with inflatable advertising. 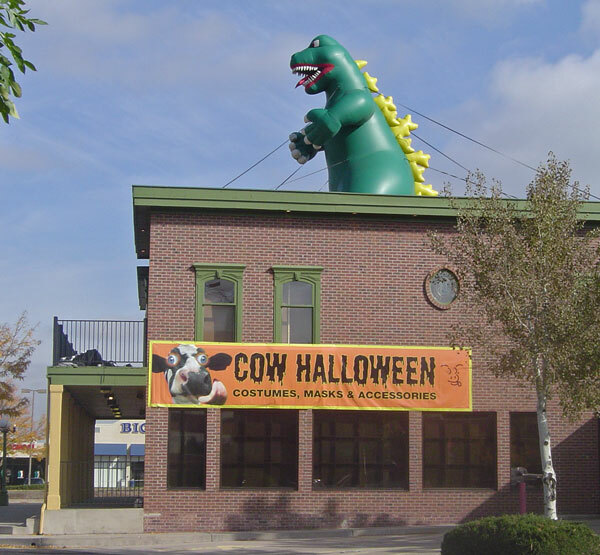 Put a huge dinosaur or gorilla on your roof! Suddenly, you've shattered the sameness of malls, stores and shopping centers, and created a visual attraction. Inflatable advertising focuses your marketing dollar on your most valuable audience: everyday drive-by traffic. You've created an impression and introduced yourself to someone new, and reminded past customers about your business. Don't become part of the commute "landscape." By changing the appearance of your business in a dramatic way, you create renewed interest. Inflatable advertising can be used to keep reintroducing your business to the public. A custom inflatable in the shape of your product is a very effective communication. A product image is the oldest form of advertising signage, dating back at least to ancient Egypt. Any Outdoor Advertising professional will tell you that simple and short is best. 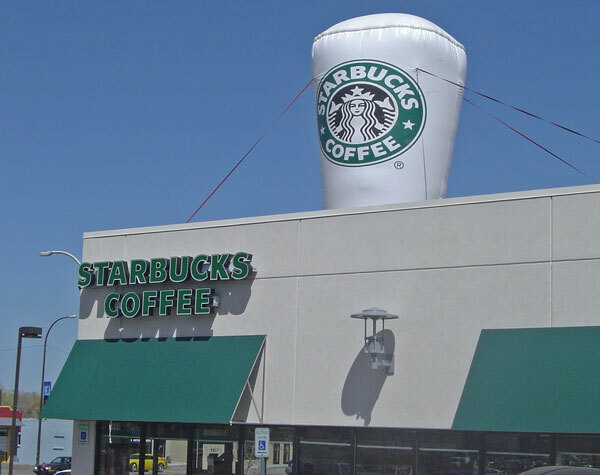 An oversized inflatable advertisement in the shape of your product is very short and simple. Unusual and/or animal shapes also command attention. Children love them, and every parent with kids on board will be directed to look at the inflatable (One roof top dinosaur = 500 times "Mommy! Mommy! Look!" everyday). Using many different inflatables (Spot Promotions offers inflatable rentals, so there's a wide variety to choose from) can keep the outdoor promotional campaign fresh, and draw renewed interest from daily commuters on the road in front of your business. Large inflatables create instant brand and location awareness. By associating your logo and/or product with your physical location, customers retain the knowledge of who you are, where you are, and what you sell. Our repeat clients for inflatables show that this form of outdoor advertising is a proven branding and awareness tool. Spot Promotions can take care of every facet of your inflatable rental or purchase, from installation and maintenance to removal, storage and cleaning. Spot delivers a worry-free promotion: You can focus on your sales and customers. Spot has over 15 years of experience in the inflatable advertising business. Put our extensive knowledge and practical experience to work for you! Inflatables can often be placed to maximize visibility from nearby roads, or areas with high foot traffic. 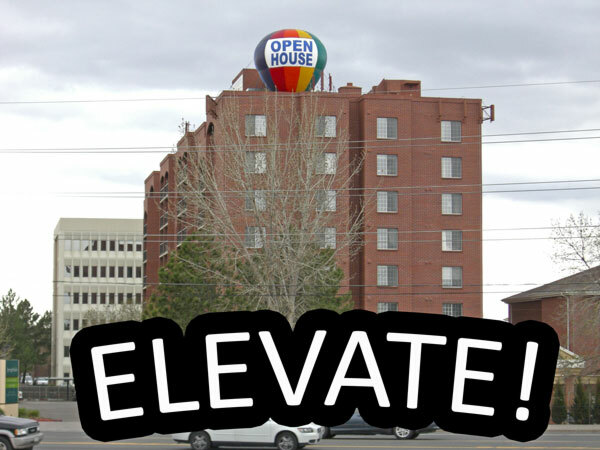 Consider using your roof to place an advertisement above the "ground clutter" and into the public view. Inflatable balloon or shaped advertising can be brightly colored to increase visibility. Grand openings, open houses, hiring fairs, sales and special events are all perfectly suited to outdoor inflatable advertising. Of course, you don't need a special event to use inflatable outdoor advertising. Simply changing the appearance of your property temporarily will draw attention from daily commuters. Without change, your business tends to fade into the background.